The Leader Al-Baqaa International Boxing Tournament was Asia’s next international activity in the busy year of 2019 which event was held in Jordan. The host nation’s Asian Games bronze medallist Zeyad Eshaish won the middleweight (75kg) before his veteran teammate Amman 2013 ASBC Asian Confederation Boxing Championships silver medallist Ihab Darweish Al-Matbouli returned to the world of boxing with a gold medal. Altogether 44 boxers from six Western Asian countries attended in the Al-Baqaa International Boxing Tournament which is a new competition in the Asian boxing map. Jordan’s best boxer heavyweight (91kg) star Hussein Iashaish was invited to attend in the Europe vs. Asia Dual Match in Prague, Czech Republic and he had to miss the Leader Al-Baqaa International Boxing Tournament. 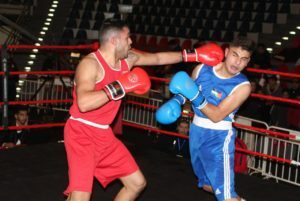 The hard work of the Jordan Amateur Boxing Association paid off in the recent years, their first breakthrough was their participation in the London 2012 Olympic Games. The main input to Jordan’s boxing life was the Amman 2013 ASBC Asian Confederation Boxing Championships on home soil. Two of their boxers qualified for the Rio 2016 Olympic Games and their goal is to achieve even more in the upcoming year. Yemen is a developing boxing country which hosted their National Championships two months ago and their best ones have been selected to compete in the Al-Baqaa International Boxing Tournament in two different teams. Their top future talent 19-year-old Sil Ghaleb Mohammed Al-Qarnas won his light flyweight (49kg) final against Jordan’s Suheib Eshaish who abandoned their fight. Iraq’s Amman 2013 ASBC Asian Confederation Boxing Championships bronze medallist Murtadha Raad Qasim Al-Sudani returned to the world of boxing and he was slightly better than Jordan’s 20-year-old Yousef Eshaish in the final of the flyweight (52kg). Jordan’s Mohammad Adnan Abu Jajeh was involved to the national elite team in 2016 and he proved his strength in the final of the bantamweight (56kg) against Hashem Alawneh. Yemen’s Youth National Champion teenage hope Nasem Hussain Al-Qathi eliminated Jordan’s Adel Darweish Al-Matbouli in the semi-final of the lightweight (60kg) which was a surprise and continued his winning path against Yemen’s Abdalalem Othman in the final. Palestine’s lone gold medal was achieved by Nizar Hadedoun who walked over to the title against Jordan’s Ahmad Al-Matbouli. Iraq’s Sahm Qarrar Kadhim Al-Ezirej achieved silver medal at the Astana 2011 AIBA Junior World Boxing Championships and in the recent years he shined in the elite level as well. He had a tough semi-final against Lebanon’s 19-year-old Hasan Mostafa El-Zaino and another hectic final with Jordan’s National Champion and former Youth National Champion Osama Khamies. The final verdict was split decision to Al-Ezirej who won the welterweight (69kg) in the international event. Rio 2016 Olympic Games quarter-finalist Hussein Eshaish’s younger brother 20-year-old Zeyad Eshaish is the current Arab Champion and achieved bronze at the Jakarta 2018 Asian Games proving his strong development. Jordan’s young talent moved up to the middleweight (75kg) in this event but he was better than his teammate Thaher Al-Nobani in Al-Baqaa. Jordan’s another future hope Mohammad Younis attended in the Budapest 2018 AIBA Youth World Boxing Championships and showed his potential as a teenage talent last year. The 18-year-old boxer impressed and defeated Iraq’s more experienced Jasem Kadhem in the final of the light heavyweight (81kg). Iraq’s former ASBC Asian Confederation Youth Boxing Championships competitor Aqeel Jabbar Mamoon claimed silver medal in the Damascus International Boxing Tournament one and half year ago and returned with strong performance. The 24-year-old Iraqi boxer triumphed over Jordan’s Yousef Al-Nobani and won the gold of the heavyweight (91kg). Jordan’s Ihab Darweish Al-Matbouli attended already in the Chicago 2007 AIBA World Boxing Championships and his career highlight was a silver medal from the Amman 2013 ASBC Asian Confederation Boxing Championships. The veteran boxer returned at the super heavyweight (+91kg) and knocked out Jordan’s Bader Abu Roman in the fist round. The Al-Baqaa International Boxing Tournament will be supporting the boxers to prepare well to the upcoming Arab Boxing Championships and the ASBC Asian Confederation Boxing Championships.